Sensory Enrichment Therapy was evaluated in randomized controlled trials. 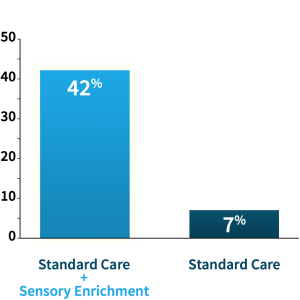 42% of the children who followed this new therapy program made clinically significant progress, compared to 7% of the children who followed standard care alone (ABA, OT, ST, etc.). In fact, 21% of the children improved so much that, although they remained on the autism spectrum, they no longer met the criteria for classic autism after 6 months. None of the children in the standard care group did. *conducted at the University of California, Irvine. 3 studies published in 2013, 2015 and 2016. You will be giving your child short combinations of sensory experiences, involving smell, touch, taste, art, music and also temperature, balance, space perception, etc. 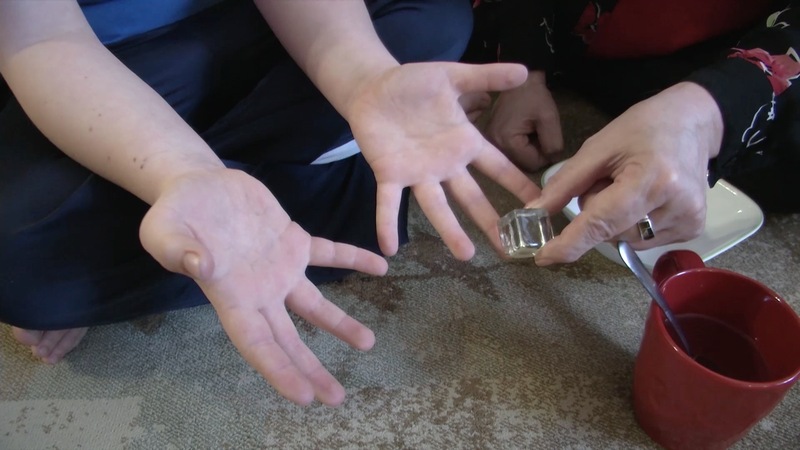 For example, one exercise called the Water Game involves a left hand placed in a bowl of cool water and the right hand in warm water at the same time. The caregiver then switches the bowls so now the left hand is in warm water and the right hand in cool water. We will switch a few times. A strong stimulus passes from the left hand to the right brain through the Corpus Callosum. The right-hand signal passes to the left brain. The warm and cool signals alternate. This is designed to be a work-out for the Corpus Callosum. Environmental Enrichment, which tells us how we can activate the mechanisms of growth and development. “My 15-year-old son who is mostly nonverbal has been doing Mendability for only a month. Already we see huge changes. He’s sleeping better, has a lot less anxiety, and is starting to use more words. All across his many activities his teachers and coaches have noticed more attention and cooperation as well as being more relaxed. As someone who has tried lots of different therapy programs, I highly recommend Mendability. I wouldn’t say that about many other therapies. The staff is very supportive and will guide you along the way. “~The first thing I noticed after implementing Mendability, was his body becoming more flexible. His body used to be very stiff, he had difficulties bending, nodding, dancing, facial expression etc. He is now teaching me to make silly faces. It is easier for him to pronounce certain words, especially words he had had difficulties with for years. He still has challenges with some words but it is becoming easier for him to learn language. ~He is no longer sensitive to loud sounds. ~He is no longer a picky eater. I just can’t believe the things he’s eating or drinking. He’s willing to try new foods. ~He became more aware of himself, he no longer bumps into people or objects. ~He became more interested in books, I’ve found him reading in his bed after I’ve put him to bed. ~And the best part that I can’t really explain, it’s like something just clicked and he understands things better. It used to take longer for him to understand or process things, I had to really work hard and be creative to teach him. Simple things like over, under, beside, opposites, transportations, just to name a few, took months and some even years for him to comprehend and I had to keep re-introducing to make sure he did not forget, what he just learned. Now he gets things much faster. “Mendabilty has significantly helped my son with severe autism. We have been doing Mendabilty for over two years now, and I would highly recommend this awesome sensory therapy to other parents! I never considered that Mendabilty would help with my son’s sleep disorders, but I credit Mendabilty 100% with eliminating his sleep problems. My son used to be bouncing off the walls unable to go to sleep. He was so loud. Then, when he did finally go to sleep he would wake up in just a couple of hours, wide awake, running around, squealing and bouncing, and he would remain awake for hours. This occurred about 5-6 times a week! I was so sleep deprived it was awful. When we started doing Mendabilty, the change was almost immediate and not only was he going to sleep within 30 minutes, but he slept through the night!! He’s 7 now and every once in a while he’ll have an off night. But he is sleeping as well as any neurotypical child his age now, which means I’m sleeping again. There have been other changes too. Mendabilty has greatly improved my son’s physical behaviors. He used to flap his arms, constantly walked on his toes, and screeched. He rarely has these symptoms of autism now. I honestly can’t remember the last time he flapped his arms. He makes a lot better eye contact, follows direction, and the support team is working closely with us to continue to regain the speech that he lost. We have Issue we are still working on, but I am hopeful to see even more changes. Mendabilty has helped me too, which is another positive effect it has had. Along with sleep, the sensory environment has been calming and de-stressing. We saw immediate results. You could literally see the effect the exercises were having on my son. 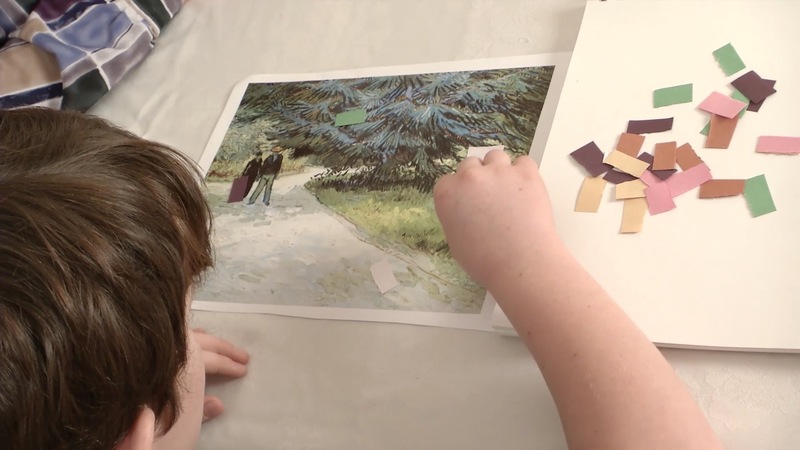 He has always had severe sensory issues so it made sense to try a sensory-based therapy. “I can’t recommend Mendability enough!! The sensory [enrichment] therapy has been amazing for our son! When we first started doing the therapies with him, he was only sleeping between 6 – 8 hours a night, which wasn’t enough. Soon after we started, his sleep consistently increased to 10 hours/night. He has made so many other advancements since then as well! Plus the program itself is so accessible. I love that you enter the updates and info online and immediately receive our new list of exercises. We also appreciate the video demonstrations of each exercise. This has been so helpful for our son to watch the video to see how the exercise is performed. It makes him more willing to participate! We’ve had seasons in our lives, where we do the therapy exercises consistently, and other times when we don’t (as life and schedules get a little crazy). I can always tell a difference when we start up again. It’s my goal this year to make Mendability a constant. I know it will make an even bigger difference for our son! 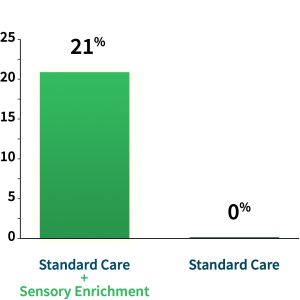 With Sensory Enrichment Therapy you can expect to make real progress and keep it. In fact, we are so confident that this can be the best investment in your child’s development that we offer a full guarantee to our Platinum clients. If you cannot make it work despite your best efforts, you get your money back. 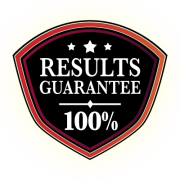 To qualify you commit to 1) completing a minimum of 75% the prescribed activities for about 15 minutes every day and 2) completing an IQ test before and after the program. We translated these simple enrichment protocols to make them available for people.